To be successful Mars colonists, future astronauts will need to know both the potential hazard and utility of the soil. Astronauts can use Martian soil to “live off the land” as building material, fuel, or a fertilizer, greatly reducing the cost of a Mars mission, which is one of the biggest barriers to sending humans to the red planet. One unusual compound that has garnered quite a bit of attention is called perchlorate; it has the potential to be both a blessing and a curse for future explorers. If you think that you have heard of perchlorate before, it’s probably because perchlorate is a fairly common groundwater contaminant here on Earth, especially in regions of California and other parts of the southwest United States. A particular type of perchlorate called ammonium perchlorate is used as rocket propellant. If enough ammonium perchlorate finds its way into drinking water from rocket testing, launches or fireworks, it can be detrimental to human health. Excess perchlorate consumption harms the thyroid by preventing the synthesis of hormones that regulate metabolism. Perchlorate has the potential to be both a blessing and a curse for future explorers. 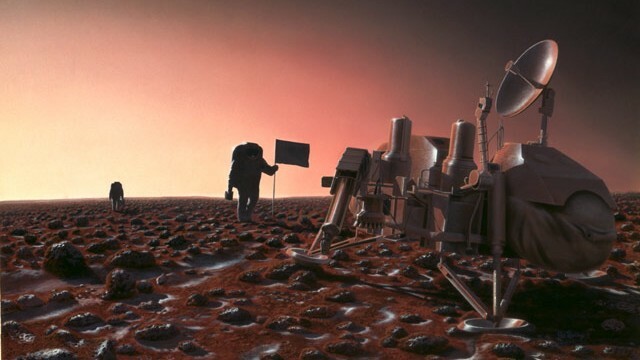 In 2008, scientists on the Phoenix lander team discovered perchlorate on the Martian surface. Last year, perchlorate was confirmed near the landing site of the Curiosity rover. Confirmation of perchlorate over 5,700 kilometers apart indicates that the compound might be found almost everywhere on the surface of Mars. While manufactured perchlorate for rocket propellant or fireworks is relatively commonplace, naturally occurring perchlorate is extremely rare on our planet. It is only known to exist in a few very dry places such as Death Valley, California and in fairly high concentration in the Atacama Desert in Chile, the driest place on Earth. Mars is much drier than even the driest place on Earth, so it is not surprising that perchlorate is present there. Scientists hypothesize that perchlorate forms naturally when volcanic activity releases a chlorine compound that undergoes chemical changes in the atmosphere and then falls back to the surface. It only stays put in the soil if it doesn’t get washed away. Scientists think that this process might be the same on both Earth and Mars. So, future Mars colonists listen up: you can’t eat the dirt on Mars, but you might be able to turn it into rocket fuel. While perchlorate is not safe for human consumption in large quantities because of its detrimental effects on metabolism (and is even used as a pharmaceutical in rare cases), paradoxically, there are microorganisms on Earth that actually eat perchlorate.